Also known as Dinosaur Kale. Green leaf, for salads, smoothies, light cooking. Grown year-round in the Tower Garden. 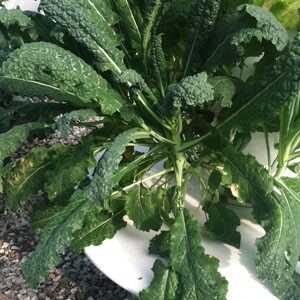 The is a well-maintained selection of Toscano kale with long, narrow leaves for attractive and tall, straight bunches. Dark blue-green leaves with beautiful savoy. Lacinato or “dinosaur” type kale. This type of Kale prefers a pH range of 6.0-7.5. Kale prefers cooler growing temperatures, but will produce good crops under warmer, summer conditions.